FiberPlex CEO Buddy Oliver, center, accepts the Neutrik premierePARTNER award on behalf of the FiberPlex WDM-16 product team. 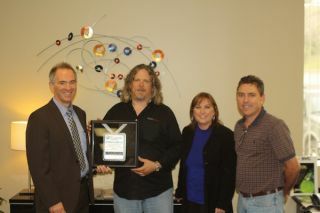 FiberPlex Technologies' active wave division multiplexer has been recognized for a coveted 2013 premierePARTNER Award by connectivity company Neutrik USA. Of more than 50,000 Neutrik U.S. customers, FiberPlex was singled out along with ten other professional AV equipment manufacturers for its product contribution to the growing fiber optic transport industry. Among FiberPlex's wide array of fiber optic products is its WDM-16 active wave division multiplexer used to convert audio, video and data signals to optical waveforms for transporting information and content over large, secure networks. Increasingly, organizations with big data needs are networking systems through optical cable and products like WDM-16 because of fiber optics' enormous bandwidth capacity, range, security, and economies of scale. Neutrik USA makes optical connectors; FiberPlex and Neutrik USA offer optical solutions for a broad range of uses, from industrial to broadcast applications. "FiberPlex is an important piece of the puzzle for fiber optics delivery because of its bandwidth-enhancing products, specifically the WDM-16," said Neutrik USA product manager, Fred Morgenstern, stating that only the most innovative companies are eligible for the premierePARTNER Award. "We consider this a very prestigious award. It is presented to less than 1% of the company's USA customer base." In addition to FiberPlex, Neutrik presented a 2013 premierePARTNER award to Shure, EAW, Leprecon, Slate Media, Ashly Audio, BAE Audio, A-Designs Audio, Benchmark Media and TMB. Unique among the winners is FiberPlex's WDM-16, which is capable of multiplexing up to 16 3GB/s channels onto existing fiber build-outs in order to increase capacity on an OC-48 platform over just two strands of optical fiber.By multiplexing new bandwidth capability onto existing fiber infrastructure, WDM-16 effectively reduces acquisition costs to pennies on the dollar compared to the cost of installing new fiber optic runs with associated labor and conduit expenses to yield the same capacity gain. "We feel very honored to get this award. It says to us—and to our customers—that quality and innovation matter," said FiberPlex Technologies CEO Buddy Oliver.